The LTO consortium has added two more generations to its tape format roadmap, extending it out to LTO-10 and a 120TB compressed capacity. The roadmap used to finish at LTO-8, and that version of the LTO tape format future was announced in April 2010. Now, four-and-a-half years later, it has been extended again. 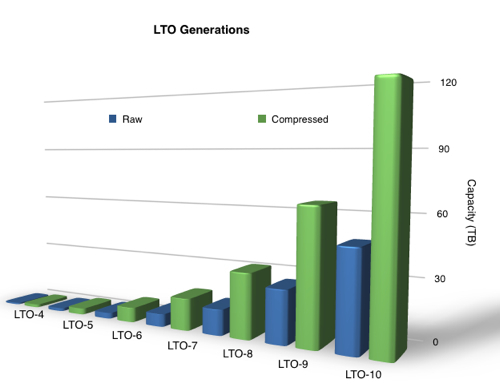 LTO generations with raw and compressed capacities. Compression is reckoned to be 2.5:1. Basically raw capacity is doubling every generation with compressed capacity increasing 2.5 times per generation. Transfer speeds are increasing at less than 2X per generation. We might assume each generation leasts for 2.5 years before the next one is introduced. The two competing proprietary formats are from IBM and Oracle. IBM has demonstrated a 154TB tape technology while Oracle has an 8.5TB raw capacity tape - making LTO-6’s 2.5TB look pretty poor. Sony, which used to a be a force to be reckoned with in the backup and archive tape market with its AIR and Super AIT formats, has developed a 185TB tape technology.